Madhavi Latha launched a 'Silent Protest' against Sri Reddy for the kind of objectionable comments she made against Pawan Kalyan. 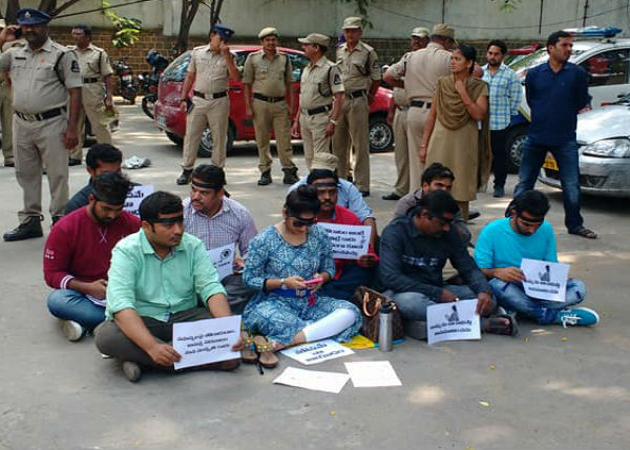 When Cops asked her to call off her deeksha, Madhavi Latha has given a written statement to make her intentions clear and pledged to continue her protest even if she was arrested. Police arrested the Actress and shifted her from the location. Not just Madhavi Latha, Several people from 24 Crafts in the Telugu Film Industry came in support of Pawan Kalyan. They came down heavily on Sri Reddy for her indecent gestures and remarks. There is severe backlash from Fans and General Public over the disrespectful remarks. As a result, The woman who claimed herself to be 'Sri Shakti' became powerless within few days. This is what happens when the person who leads any movement deviates from the actual cause. What happened in the Casting Couch issue is a big lesson for people like Sri Reddy, Women's Organizations and Media. One Should Know How To Lead A Movement!